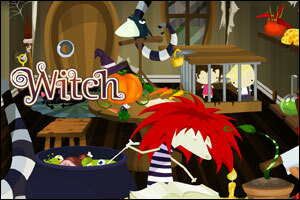 Witch features beautiful graphics and animations, and you will probably enjoy this one. Plus it has two different endings! And I have absolutely no idea what to do. Did a few things to make things move but no real results. pretty cool. I am out, but basically just kept clicking on the hot spots finally got out. click the three carrots on the table from right to left then click eye and put it into the cauldron and read paper. then click the wihite and black vine on the left then click the bird. when the three arms come down, click each one quick so that they all give blood to the pumpkin. then the pumpkim will will grow eyes and spit on the bug. clcik the bug so it goes over to the key.clcik spider above the bug. then clcik the purple pepper on the lower right corner then the eye ball. it goes into the cauldron. clcik the left part of the book again and it shows flowers. click the piece of corn to attract the bird, then click the bord to get feathers. click the kid to get cheese, then clcik the right hole. click the right hole again and then the feather. click left hole twice. click right hole, then click the lock. then click the end of the new tube to get another eyeball. then click the bug under the bird to go to the right side of the room near mushroom. clcik the kid on the left. then click the door. then clcik the poioson and the bug will eat the big guy. then click the bug at the top right so that it is on the mushroom then clcik the mushrooms. then clcik the door. figure out code and your out. i clicked the left side of the book 3 times and after each one i clicked the red peppers. then after a while you say to click the left side of the book again…..it doesnt let me!! WHAT SHOULD I DO?!?!!?!?!? wait, never mind, i figured it out. IM FINSIHED IT NOW!!!! thank you monte!! I used the in game video walkthroughs. Posted on Friday, April 23rd, 2010. Follow any responses through the RSS 2.0 feed.